Yes! Another color-pattern post! See note below the chart for the braiding method for 6-loop flat braids. The chart below just describes how to set up your colors prior to braiding, in order to get these particular color patterns. Six-loop braids have some awesome color-pattern possibilities that are not possible with 7-loop braids. That’s because certain color patterns can only be braided with an even number of loops…Like stacked W-patterns in flat braids, for example. 6-loop flat braid color patterns # 1, 2, 3, 4, 5, 6, 7, 8, 9, 10. In the chart I show a thumbnail photo for each color pattern. Some patterns have photos of more than one braid—the upper braid is always the one in my setup instructions. Any others are alternate “colorways” of the same pattern. Any of these set-ups for 6-loop flat braids can also be used to make a 6-loop square braid. The color pattern may turn out quite differently when braided as a square braid—especially if the set-up includes any bicolor loops. If you are setting up to braid any pattern that includes bicolor loops, be sure to double-check before starting to braid to make sure that the bicolor loops’ upper and lower colors are correctly arranged. In my set-up instructions, the upper color for any bicolor loop is underlined. That color should be uppermost on the finger, and the other color should be in lower position on the finger. Note: This type of color-pattern can be made with any even number of loops (2-loop braids, 4 loops, 6, 8, etc) See photo in footnotes below of a 4-loop example in red and white. Note: An 8-loop flat braid called Lace Piole is described in 15th C loop braiding manuscripts. This 6-loop version has the same color pattern. Notes: 1.The thumbnail photo braids show three color variations of the same “3 W’s” pattern. See Hannah’s version in my footnotes below chart. 2. See a square braid version of the uppermost braid in footnotes below chart. Note: This pattern is a 6-loop semi-close version of the 8-loop braid called Lace Daunce or Lace Dawns in the Medieval loop braiding manuscripts. 6 loops: 2 red loops; 2 white loops; 2 black loops. Notes: 1. 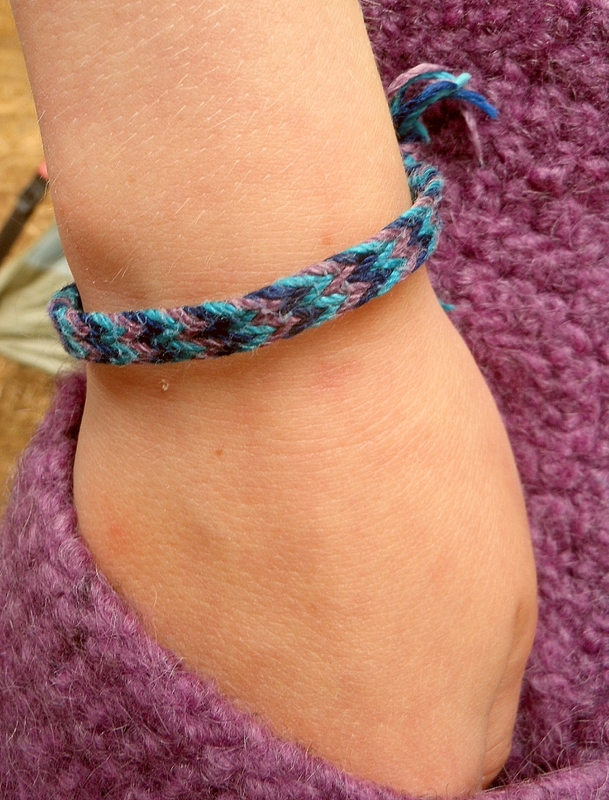 This makes a great square braid color-pattern, too. 2. In the lowest two braids, the 2 “piole” colors have much less contrast than in the top braid. The lowest braid’s “W” color is white. Its two “piole” colors (dark navy and dark brown) are very close in value. This makes the pattern start to look more like #4—thick/thin W’s. Note: This pattern is very close to the first one (zebra stripes). It’s like a red and white Zebra Stripe with one black contrast loop taking the place of one of the red loops. In the lower braid, I used a thicker thread for the contrast loop (in this color version, black and red are the main colors, with white as the contrast color). Note: The only set-up difference between this pattern and the following one is in the upper-lower orientation of the three bicolor loops. Note: This set-up makes one of my favorite 6-loop square braid color-patterns — in a square braid the colors line up quite differently than than they do here. Notes: 1. The square braid version of this set-up is even nicer IMO—it has lengthwise stripes in two colors, interrupted by white wraparound W’s. 2. The example braid with wilder colors was done with bicolor loops in several colors and shades rather than just two. (oranges + dark greens; reds + dark blues). The braiding method for 6-loop square or flat braids is a combination, shown in two of my tutorials: 5-loop braiding moves for one hand, and 7-loop braiding moves for the other hand. Click this link for my Bicolor Loops tutorial if you want to learn about setting up and braiding with bicolor loops (loops that are half one color, and half another color). When I first learned 7-loop square braids, I found the shifting move between the ring and little fingers very difficult. Some people have no or little trouble learning this, but to others it can feel almost impossible at first. I was very determined, and after a few days’ practice, it was no longer a problem. But it might have been easier if I had learned this 6-loop braid first. In this 6-loop braid one of the two hands performs 7-loop braiding moves—the first hand to start braiding. The other hand just does 5-loop braiding moves. This can make the 6-loop braid an easier, gentler way to get used to 7-loop moves, one hand at a time… Start with 3 loops on each hand, and do the first braiding move with either the right or the left hand—whichever one you want to use for the 7-loop braiding moves. The other hand can take it easy with 5-loop moves. (and learn by watching! I think this really does happen to some degree). Start with two loops on each hand–A red, B white. 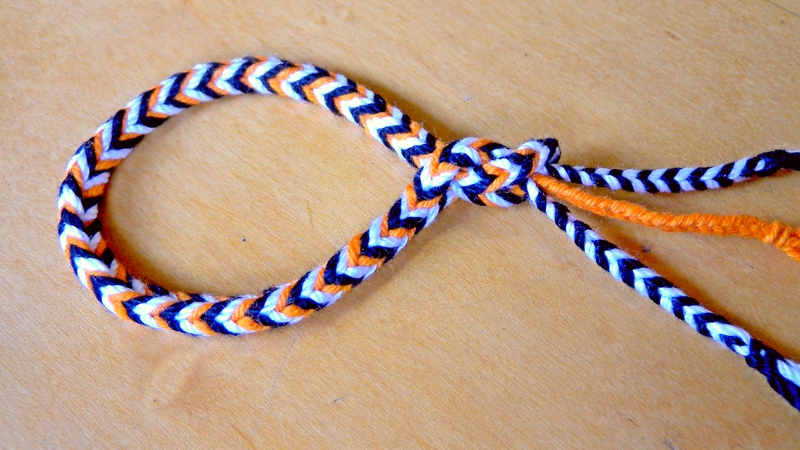 The two ending “braidlets” are two-loop braids in this same “zebra-stripe” color alternation. Each braidlet was made from one white and one red loop. However I could have gotten the same effect from braiding a four-loop divided braid. (Wool weaving yarn). #5, Piol + W looks fantastic as a square braid. (The red/white/black version is uber-heraldic!) Can’t go wrong with this as a square braid. #6, Bordered Chevrons also makes a great square braid. 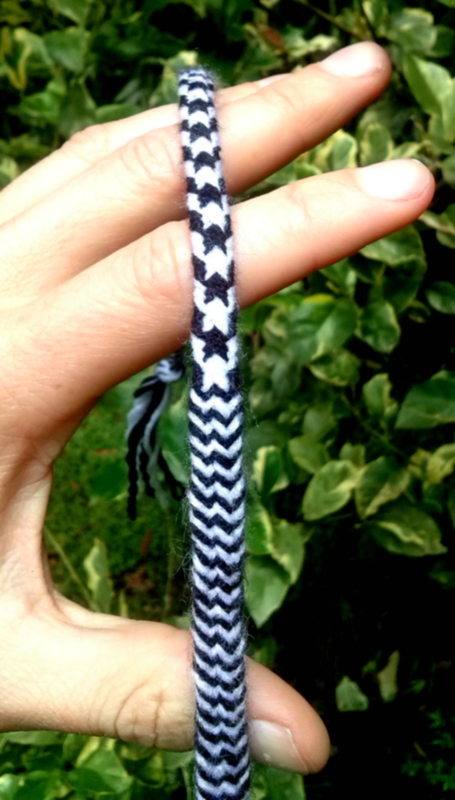 This pattern isn’t only for even #’s of loops, it works well as a full 7-loop braid as well (either square or flat). Just add one more red loop (onto one of the D-fingers). #9, Bicolor Zebra-stripe 2: this color set-up makes one of my favorite 6-loop square braid color-patterns…Quite different-looking than the flat version because of the bicolor loops. #10 Thick Bicolor + thin W: Fantastic as a square braid! The navy and blue areas should end up like bicolor “Edge” lengthwise stripes up and down the braid, interrupted by thin “wraparound” W’s. A great shot of a beautiful braid! Thanks for sending these, Ricky! Hannah had seen five-loop braiding the previous summer, but certainly not six-loop, and not this color-pattern, either. She came up with both on her own at home. Reeling from that, I also had to do a double-take to check out how perfectly aligned the W’s in her braid had come out. Not to make any of us adult braiders feel bad, but this isn’t always the case with those somewhat pesky W’s. They don’t always turn out this well for me unless I do a little extra fussing that I know Hannah does not bother with. See my TMI tips below. Or instead of reading those tips, just braid like Hannah and her friends: with a light, effortless touch, no fussing and no overtightening! W or a slanted line? Those W-shapes can often come out more like slanted lines across the braid than true W’s. Slanted lines can look fine, too! But if you want W’s, and it’s not coming out that way, there are ways to tweak your braid while you are braiding to make sure they start out and stay as W’s. A fully-flat braid almost always braids folded. That is, sort of in a square-braid shape. Actually it is folded the way a book is closed, and you’ll open it up—unfold it—after the braid is done. So, first of all, make sure that’s how your braid looks when you first start braiding—sort of like a square braid, but with a slit into the right edge. That slit is where it will open later. Or it might look “cupped” or folded into two layers with an open area on the right and the fold on the left. Start loosely, and make sure your braid is in a folded shape before continuing braiding. 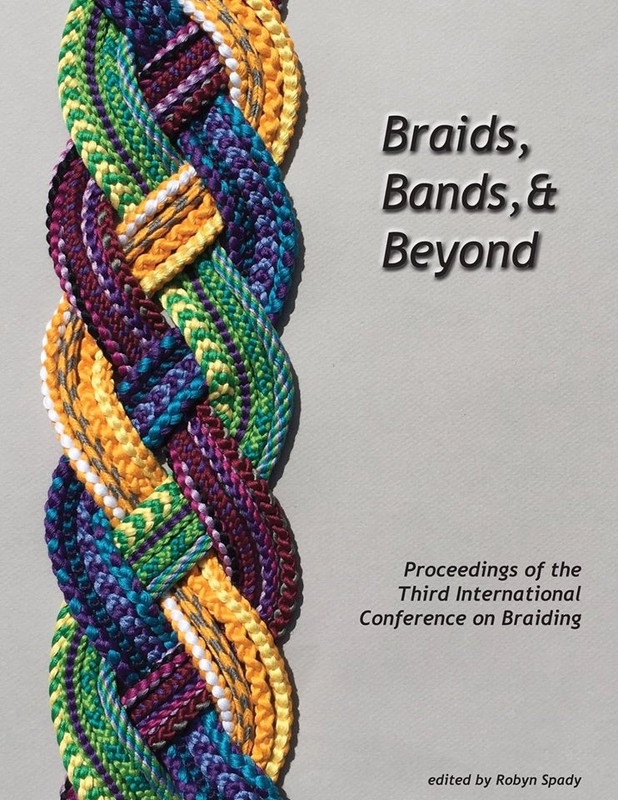 A “partially-flat”, overly compacted braid doesn’t look folded while you’re braiding it. The trouble with that compacted “partial flat braid” shape is that it can be self-perpetuating. Once a braid has taken on this compacted shape, even braiding loosely won’t fix it. With each braiding move, the threads will tend to conform to the shape that has already been established above them, and settle into that 3/4-flat shape. Even when you braid a “fully flat” braid of four columns, the W-pattern can still sometimes morph into what looks like trailing diagonal lines instead of W’s. To guard against that happening, pause regularly while braiding to check how the braid looks on its slitted edge—the edge that’s really the two edges of the flat braid, one on top of the other. You’ll have to lean over to the right of the braid and look at that edge, or else tip your loops so that edge of the braid turns upward and you can look at it straight on. You are checking to make sure that the color pattern matches evenly on either side of the slit. Say you are braiding black M-shapes (the W’s will look like M’s on that outer, folded-around side of the braid): The two “feet” of those M’s should meet at the same level on either side of the slit in your braid, as if they are trying to meet and form a V together. If they are level with each other, good! But if one side of the V is higher than the other, fix it NOW to get them even with each other. After that keep checking as you braid, and try to adjust your regular tightening moves so that the M-motifs stay even and don’t start to slant. Btw, if you braid the way I teach here, the W’s look like M’s on the back/ outside of the braid, and W’s on the inside—the side that shows later on when you open your braid. Most of the sample braids in these photos were made with a 3-ply crochet cotton called Aunt Lydia’s Fashion Crochet, size 3. This size 3 has a somewhat softer twist than most crochet cottons, which makes it pack together well in a braid. It’s about twice as thick as embroidery floss. It doesn’t come in many colors–no real orange for example, so the orange I used in pattern #3 (Three W’s) was another type of yarn entirely—an old roll of some kind of weaving cotton. Links to yarn sources, and more yarn suggestions can be found in my 3-loop braid tutorial, below the pdf window. Many other kinds of yarn or thread would work well, too. I used wool for the 4-loop example braid in the photo above. You can also get great effects by mixing different types of yarn or thread. One or a few shiny silk or rayon loops can be a great contrast in a braid that is mostly non-shiny cotton or wool. See complete copyright restrictions and permissions at the bottom of the sidebar on every page of this site. Any braids you make using my tutorials are wholly yours, may be marketed and sold. Copyright applies to my words, videos, and images on this site. Hola!!!!! muchísimas gracias hice lo que me dijo y POR FIN!!!! ya me salió. GRACIAS 1000!!!! I hope Ingrid doesn’t mind if I answer… check the color linking tut. If you replace black in the first video with bicolor loops you should get five stripes. Learned the linking technique just for that purpose too, but since my pride bracelet has a black border, the bicolor thing is just a guess. Hi Bat thanx for answering! I’ve been gone on a camping trip the last two weeks, nice easy van-camping but no good internet connection… That’s a really good suggestion to do color-linking with bicolor loops to get those rainbow colors. @ Sofia, I’m really glad you brought this up! someone else asked me about rainbow pride patterns recently and I meant to try some out but then forgot all about it…Anyway, if what you want is five different colors of W’s going down the braid like the “3 W’s” pattern above, then no, you couldn’t do that in this particular braid. It takes a 10-loop version of this braid in order to have 5 colors of W’s. The method for that is halfway between a 9-loop braid and an 11-loop braid. As Bat said, if you would like to have separate lengthwise stripes / columns of colors, you could have up to 5 or more if you used bicolor loops and color-linking moves. My 7-loop color-linking post shows how to link colors for lengthwise stripes. Or if you’ve learned double braids, the flat variation of a double braid can have up to eight or more columns of different colors. The long photo of a braid higher up in my sidebar is a flat double braid with columns of colors in some places–with bicolor loops those columns could all be different colors. You can make double braids with 6 or 8 loops, doesn’t have to be ten. If you don’t need to have the colors in separate columns, you could just have five colors following each other nested into a lengthwise zigzag that crosses itself…hmm because of crossing itself, the pattern would probably would end up looking more plaid-like than zigzag. To get the colors into a particular order in that plaid or crisscrossing zigzag design, you would start with that order on your fingers: Left to right on the left hand, followed by RIGHT to left on the right hand. (there’s more on this in my post on planning color patterns). –ok, now I have to try out some of these rainbow ideas! Could you do a video on #5? I am a rather visual learner.. I think I understand what you are doing but I have doubts that I fully understand. Thanks so much for checking out my site! I do have a video for the braiding method elsewhere on my blog. (The chart above with braid #5 just shows how to set up the colors on the fingers, it doesn’t teach how to make the braid). The braiding method is covered in my video for 7-loop square and flat braids: Continue Here: 7-loop square and flat braids. Have you followed that video yet? When you do, I can email you to answer any questions about this six-loop flat version, and give you a more detailed description of the color info for #5 or any of the other ones. If you contact me on my email contact form (also nested under “ABOUT” at the right of my top menu), I can email you privately. Thanks so much! I got out some supersaver yarn of all things and just went for it after watching a number of your videos. and I am happy to announce that I got it and I made a few mistakes. However, I know what my mistakes were and how to avoid them next time which I think is important. Looking forward to trying more. Thank you so much for this site and the youtube channel. 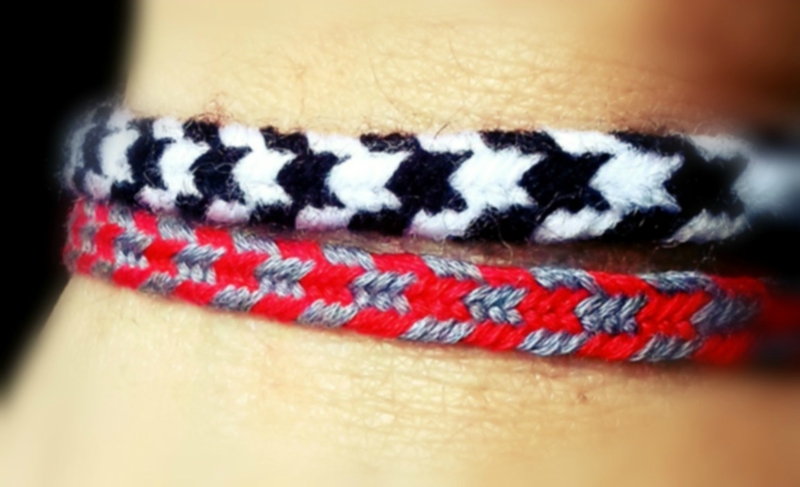 The red and grey braid reminds me of a bright yellow and grey braid I made. In heraldic terms, it looked like gold and silver, which you should never put together (metals go with colours, and colours with metals, for more contrast and visibility). What my braid REALLY looked like, though, was trim for a medieval safety vest. I should get back to learning how to make more braids, but thee re are so many hobbies… Plus I suffer from ADOS: Attention DeficOh Shiny! I’ve been trying these 6-loop braids and the results are delightful! Hi Europa, it’s nice to hear from you! I’m so glad you liked the braids! Hi Julie, you’re welcome and thanks for the note, I hope you have fun with the braids!